Summary: Preaching on today’s Introit to a gathering of nursing home residents, I noted that it’s much easier to “give thanks to the Lord” when life is fairly easy. However, the Psalmist calls us to be thankful in all circumstances, reminding us that “the God of heaven” steadfastly loves us at all times. He supports and defends us in our “low estate,” redeeming us from our lowest estate of sinful natures forever at enmity with Him. He cares for us body, mind, and spirit but, above all else, works to create and sustain faith that we might have life forever with Him. 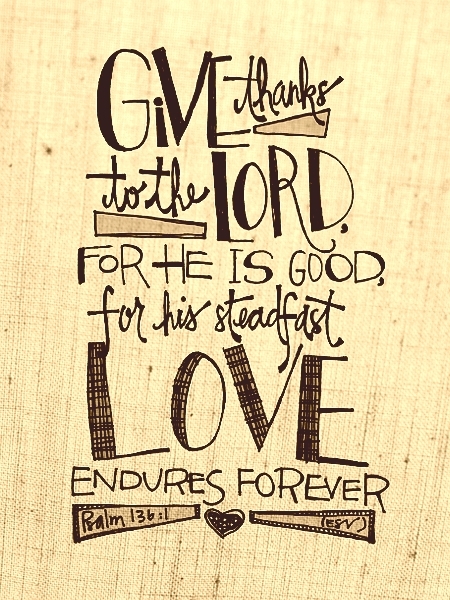 Text: Give thanks to the Lord, for he is good, for his steadfast love endures forever. It is he who remembered us in our low estate, for his steadfast love endures forever; and rescued us from our foes, for his steadfast love endures forever; he who gives food to all flesh, for his steadfast love endures forever. Audio: Click to hear the MP3 of Steadfast Love.